There is presently a public health crisis plaguing Flint, Michigan. Lead contamination in the water has led to a major public health danger. Back in 2014, Flint changed its water source from the treated Detroit Water and Sewerage Department water to the Flint River. Since then, Flint’s drinking water has had a host of problems. On Lawyer2Lawyer, hosts J. Craig Williams and Bob Ambrogi join professor Peter Jacobson, professor of health management and policy at the School of Public Health at the University of Michigan and professor Peter J. Henning from Wayne State University, as they take a look at the Flint water crisis, the violation of public health laws, liability, the impact on the Flint community and their health, litigation and long-term effect. Professor Peter Jacobson is an attorney and health policy expert whose research focuses on public health law and public health systems and services. He is director of the Center for Law, Ethics, and Health. Intro: This is all going to take years to sort out. And so it’s not like we’re going to see any kind of quick recovery for the people in Flint. The local health department could have stopped this immediately. Bob Ambrogi: And this is Bob Ambrogi coming to from just outside of Boston, Massachusetts where I write a blog there called Lawsites and another blog called Media Law. Craig Williams: Bob, before we introduce today’s topic, we’d like to thank our sponsor, Clio, an online practice management program for lawyers. You can find out more about Clio at www.GoClio.com. Bob Ambrogi: Craig, there’s presently a public health crisis plaguing the city of Flint, Michigan. Lead contamination and the water has led to major public health danger. It all started back in 2014 when Flint changed its water source from treated water being provided through to the city of Detroit to water taken out of the Flint river. Since then, Flint’s drinking water has had a host of problems. Craig Williams: This Flint river water then caused lead from aging pipes to seep into the water supply, causing extremely high levels of lead between 6 to 12 thousand children have been exposed and they may experience a range of health problems. On January 21st this year of 2016, the EPA issued an emergency administrative order binding that the city of Flint and the state of Michigan’s responses to the drinking water crisis, Flint had been inadequate to protect public health and that these failures continue. So today on Lawyer 2 Lawyer, we’re going to take a look at the Flint water crisis, the violation of public health laws, who’s legally responsible, the impact on the Flint community, and the residents’ health, litigation, and the long term effects that this crisis is likely to cause. And to do that, our first guest today is Professor Peter Jacobson, professor of health management and policy at the School of Public Health at the University of Michigan. Peter is an attorney and health policy expert whose research focuses on public health law and public health systems as well as services. He is director of the Center for Law, Ethics, and Health. 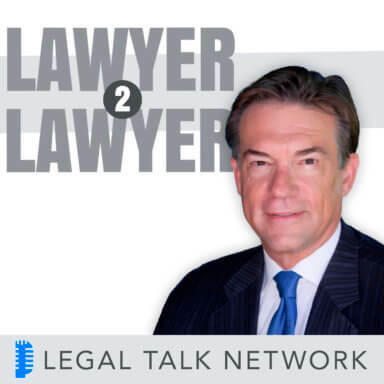 Welcome to Lawyer 2 Lawyer Professor Peter Jacobson. Professor Peter Jacobson: Thank you very much, it’s a pleasure to be on the phone with you. Bob Ambrogi: And also joining us today is a returning guest to this show, Professor Peter Henning from Wayne State University Law School. Professor Peter Henning teaches courses in corporations, white collar crime, professional responsibility & the legal profession, criminal law, criminal procedure, criminal pretrial advocacy and securities litigation. He was on our show five years ago on a very different topic talking about campaign finance law. But he’s been writing recently particularly on an article in the New York Times titled, “Assessment of Flint Water Crisis May Hinge on Stupidity vs. Criminality.” So we’re happy to have back to the show, Professor Peter Henning. Welcome to Lawyer 2 Lawyer. Professor Peter Henning: Thank you. Bob Ambrogi: So I wanted to start with Peter Jacobson if I could and just ask if you could give us a little bit of the chronology of how this crisis evolved and how we got to where we are today. Professor Peter Jacobson: Happy to do that. The chronology starts with the appointment of the emergency manager in Flint. That’s important because influences in the way the legal issues play out in terms of the amendment, the authority for actions taken and not taken. In the Michigan law, the governor has the authority to appoint an emergency manager during stress. Flint was under considerable economic pressure and the governor appointed an emergency manager who under Michigan law, has total authority to make decisions on behalf of the city of Flint. Bob Ambrogi: Is that like a receiver, essentially? Or something like that? Professor Peter Henning: That’s an interesting question. One of the analogies to be made is whether this is a receivership. Certainly the analogy is apt, whether the legal implications of that analogy are going to play out in the same way is something that I haven’t looked at yet but is on my agenda, so that’s a great point. But effectively it’s a receivership. One of the first actions the emergency manager took was to shift the water to Flint despite the fact that there was almost immediately concerns about the taste and colors of the water. The action was taken to save 5 million dollars. And the emergency manager did not consult with the community, ignored both the health department’s concerns, and those of the county commissioners in making a decision. Not too long after that, the complaints continued, they were ignored, there were complaints to the health department’s environmental quality; they were ignored, Chicago reached to the EPA, ignored the complaints. Then you had the Legionnaires’ disease that also was ignored. Finally, all of this exploded when Professor Edwards from Virginia Tech talked about the corroded lead pipes, and Doctor Hanna identified children who had been exposed to lead poison as a result of the water. Then finally, the governor started to take action. People lost their jobs at the state department of environmental health, quality people lost their jobs at the EPA. And that’s where we are now with the state of Michigan putting in some money to rebuild the pipes and some federal money to begin to treat people – particularly children – with the exposure of led. Craig Williams: Professor Henning, as we look at the liability for this type of thing, both civil and criminal, how does all of this play out in the long run and how does immunity play into it? Professor Peter Henning: Well, certainly you have issues of sovereign immunity with regard to any lawsuits against the state or from the Flint city council. You have, as Dr. Jacobson was talking about, emergency manager. Part of that statute included a grant of absolute immunity. So the city manager can not be sued for damages. So at least on the civil side, you do have issues that are going to come up as to who can you sue. Even if you can sue the city of Flint, Flint really doesn’t have two nickels to rub together so that’s why they’re in this mess. So it doesn’t do you much good to go after the city of Flint. Maybe you can go after the state although that’s going to be a tough call. So on the criminal side, possibly some cases. They’re certainly being explored, involving for example, Michigan Department of Environmental Quality people. Maybe some of the people who reported to EPA. Michigan has a law called misconduct in office, or a crime called misconduct in office; maybe that. But on the criminal side those are going to be tough cases to establish too. So the legal liability, if you’re talking damages, is still going to be played out. I wonder what you’re going to get unless you get an appropriation out of the state of federal government to compensate people. Professor Peter Jacobson: One of the essential issues here is establishing a compensation fund. It could be modeled on the vaccine compensation fund for example so that you don’t necessarily have to show causation if you have lead poisoning you’re entitled to compensation. As Professor Henning suggests, who would fund that remains an issue, but it’s one possibility here. I’m wondering also whether something in the emergency manager law that could be used for litigation for failure to undertake a health impact assessment. Professor Henning, do you know anything of that? Professor Peter Henning: I guess that would be a possibility, although again, because of the civil side, you have the immunity granted. On the criminal side, if I’m a prosecutor, I don’t know if I want to bring a case that starts bringing in some rather complicated health judgment issues saying you should have known this and you should have done a better job. Should haves are tough to establish in a criminal prosecution. Professor Peter Jacobson: There seems to be gross negligence here. Professor Peter Henning: If anything comes to gross negligence, this is going to be it. But then on the criminal side, you have the issue of could you convince a jury when you have so many different players. Craig Williams: It triggers the idea of whether there’s insurance to cover this. Is there anyone along the chain that’s been involved in this from a governmental entity standpoint that might provide coverage to its citizens for this? Say for example the city? Professor Peter Henning: As I understand it, both the city and the state use that very famous insurance company called self insurance for any type of amount. So really what you’re looking at is the legislature, or congress or some combination to create like Dr. Jacobson said, some type of compensation fund. Now you’re in politics rather than insurance. So I don’t think there’s a deep pocket here except for the Michigan state legislature and maybe the congress. Bob Ambrogi: As I understand it there have been a number of lawsuits filed already. I’m not sure of the count, I saw at least ten had been filed; some of them are class action suits. And in the news reports that I’ve read about them, some of the lawyers are saying they’re not worried about the sovereign immunity issue because they’re pursuing “creative arguments” on behalf of the plaintiffs in these cases. Do we know yet what those creative arguments are and how they might try to get around the sovereign immunity issue? Professor Peter Henning: One way around it, of course, is not so much for damages but to seek an order to fix the pipes, deliver water that is not a health threat and things like that. And certainly one part of the lawsuits, there was one filed by an organization of administrators in the ACLU that said, “Look, you’ve got to comply with the Safe Drinking Water Act.” The problem with any order in those cases is going to be that’s what the problem is. We’d love to be able to fix the pipes but where do you come up with the- I’ve seen numbers running from 2 billion to 7 billion to fix the pipes. Who’s going to come up with those dollar figures? I do like lawyers saying they have creative ways to get damages but good luck. Professor Peter Jacobson: You argue sort of from an equitable remedy asking for a mandatory fix of the pipes and then up to the state to figure out how to do that. So you can do it in some more cost effective ways. Perhaps you could check priorities based on certain criteria, a number of children and other vulnerable populations in the house. Even if you can do that, though, it’s’ not going to provide damages. So for those who are facing damages, I agree that sovereign immunity is hard to overcome in this kind of case. One could argue that there are constitutional violations here. One could argue that it’s a due process violation because of the appointment of the emergency manager. The state essentially takes responsibility. The problem is, again, you get damages and due process violation even if you can overcome some of the barriers. It’s not my area of law so I doubt that it satisfies the individual plaintiffs. Bob Ambrogi: One of the news articles that I read said that one of the lawsuits makes that very claim. Again, I haven’t seen the lawsuit itself, but an article in Newsweek said that one of the Flint lawsuits makes a federal constitutional argument. It contends that the decision to switch the water source denied residents their civil rights to bottle integrity and be free from state created danger. Professor Peter Jacobson: Right, you have to overcome the case that really ranged the bar of being able to sue a state for this kind of negligence. The difference is the state never took custody of a child who was in Eaton and killed by a spider. Here, I haven’t seen that either but you have to argue that by appointing an emergency manager, the state essentially takes control and therefore it has the responsibility of acting reasonably and with all due regard to investigating the facts. That’s where this whole question of what’s the emergency manager’s responsibility with regard to protecting the public’s health while he – in this sense, he – is operating to relieve a stressed city from mismanagement. Craig Williams: We’re going to take a quick break to hear a message from our sponsor. Bob Ambrogi: Welcome back to Lawyer 2 Lawyer, this is Bob Ambrogi and joining my co host, J. Craig Williams, and I today to talk about the Flint water crisis are Professor Peter Jacobson, professor of health management and policy at the School of Public Health at the University of Michigan, and Professor Peter Henning from Wayne State University Law School. There are so many areas of law impacted by this. There are environmental law issues, criminal law issues, tort law issues, constitutional law issues. I wanted to follow up just a little bit more on the constitutional law issues that we were talking about. I forget which of you alluded to this, but there is this gross negligence exception as I understand it under the state constitution in Michigan that does provide a way around the sovereign immunity laws. What does that do and who might that apply to here? Professor Peter Henning: For gross negligence to provide it and to get around the sovereign immunity, it’s going to require showing the state involvement and the question is that Professor Jacobson had mentioned is does the emergency manager equate to the state. Emergency managers are appointed by the state, but this was a law that was designed to give the state the power but not the responsibility. So would a court end up attributing the emergency manager to the state and then of course, you have to prove the gross negligence and identify someone in the state. You have an object failure here, but can you attribute it to the state? And then of course you have – as in any tort lawsuit – you’ve got the damages issue. Certainly there have been damages, but when you’re talking about individual recovery, how far does it go, what does it cover? So that’s really going to be an important issue. Bob Ambrogi: And approximate cause I assume would be a tough issue in establishing the connection between the lead poisoning and the lead water. Professor Peter Jacobson: It could be. But from what I heard from my colleagues who are experts in the science, it seems pretty clear that the lead levels that children and adults have been exposed to from the Flint river are statistically significant. And therefore, I think it’s more probably than not that the switch to the Flint river can be shown to have caused an increase in lead levels. You don’t necessarily have much data on individuals effectively, but you will have population data that there’s statistically significant change with the shift that could meet the burden of proof. Professor Peter Henning: This is all going to take years to sort out. Professor Peter Henning: So it’s not like we’re going to see any quick recovery for the people in Flint, and they’re the ones who really need the help. Craig Williams: Are we looking here at the death of a city? I have not heard one good thing about this crisis yet. Professor Peter Henning: Well unfortunately, Flint has been teetering on the brink for quite a while. Roger & Me, if you’re familiar with that, was about closing the auto plants in Flint. Does it kill Flint? Well, unfortunately of the large population there that’s so poor, they can’t move away. But it’s going to require something pretty dramatic to save Flint. Professor Peter Jacobson: The University of Michigan faculty from all three campuses who are interested met in Flint. One thing that the Flint faculty said – and some community representatives also – is yes, Flint has a hot poverty level. Yes, income is way down from the 1960’s. But there’s still a substantial portion of the people who have money who sometimes destroy. There’s a new cultural center and are getting no attention. The community is very frustrated for obvious reasons. All of the stories about Flint are negative and they understand. But none of the civilians of Flint residents and the community of organizations is being captured in the media attention. Craig Williams: What’s the takeaway from this? What are we supposed to learn as a government about how to handle these situations? What do we need to learn? Professor Peter Jacobson: I think the first point is to understand that when there’s a fiscal crisis or any sort of crisis where an emergency manager must be appointed – and many states have similar legislation – any decisions that are made must take into account the potential health effects. Just look at this: to save 5 million dollars, we’re now talking about 2 billion or even more than that. So for me, you can not have as Professor Henning suggests that power without responsibility. If you’re willing to take power then you must take responsibility as a state government. That key failure must be rectified in any similar situation. Professor Peter Henning: And I would just add to that when you look at how this situation developed, that there are real limits to what the law can do. There’s a law in the books called the Safe Drinking Water Act that says you’ve got to do this to protect the population and they’re drinking water and relied on state and local governments. It didn’t have any enforcement provisions in there really because people assumed that state and local governments would do the right thing. So Professor Jacobson says all of a sudden you have a financial crisis and no one thought this through. So the law is going to rely on state and local governments. And we know there are states that have massive pension liabilities and could be facing – if not bankruptcy – at least very severe financial problems, what’s going to be the health impact of that. Because the easiest place to cut back is on expenditures to deal with infrastructure and things like that. This is an infrastructure issue. And of course, let’s say 5 million dollars. This is truly penny wise and foolish. Bob Ambrogi: Where were the legal protections before this all happened? Shouldn’t there have been some procedures in place that would have required a more thorough analysis of the decision to shift this water supply and the impact it might have? Professor Peter Jacobson: There are but they’re all suspended by the emergency manager of law which provides no requirement of taking effect into account under admission and public health code. Both the state and local health department have parallel authority to take action. So responsibilities from the local health department could have stopped this immediately or certainly gone to court to argue that the shift would threaten the public’s health. But the emergency manager law strips the department of any authority and you start setting favor of the emergency manager. That’s the failure. That’s the deficiency of the emergency manager law. Professor Peter Jacobson: You’re right. What happened was that the initial testing was flawed. So the initial testing suggests that there were no major problems. It was wrong. The testing was poorly done. And then simultaneously, the health department did complain. The health department made a statement that the switch should not have happened and argued to drop it. The county commissioners supported the health department but the emergency manager ignored the community’s concerns. Craig Williams: Well, gentlemen, it looks like we’ve reached the end of our program. We’d like to give you the opportunity to share your final thoughts and contact information. Professor Henning, let’s start with you. Professor Peter Henning: Well certainly when you look at what happened in Flint, can it happen anywhere? I hope that the answer to that is no. But this is a series of seemingly small missteps that now have suddenly burgeoned into a real issue. So it can happen anywhere. As far as contact information, I’m easy to find, I’m at Wayne State University. My email is [email protected] and on Twitter, @PeterJHenning. Thank you for the opportunity too. Craig Williams: You’re welcome. And Professor Jacobson. Professor Peter Jacobson: For years, the state of Michigan, other states and the federal government have been underinvesting public health and specifically mortality in our infrastructure. This was a disaster that was inevitable. It’s important to understand that one of the basic functions of government is to protect the population’s health. Flint demonstrates the consequences of not taking that seriously. We need to reinvest in public health in our infrastructure to avoid similar occurrences in the future. My contact information is [email protected]. I’d be delighted to talk to anyone who is interested. Thanks very much for the opportunity to be on the show. Bob Ambrogi: Peter Jacobson and Peter Henning, thanks so much to both of you for taking the time to be with us today. Again, we’ve been talking with Peter Jacobson from the School of Public Health at the University of Michigan who’s both a lawyer and a professor and health policy expert. And Professor Peter J. Henning at Wayne State University Law School. That brings us to the end of our show for today. This is Bob Ambrogi and thanks for listening. Join us next time for another great topic. When you want legal, think Lawyer 2 Lawyer.